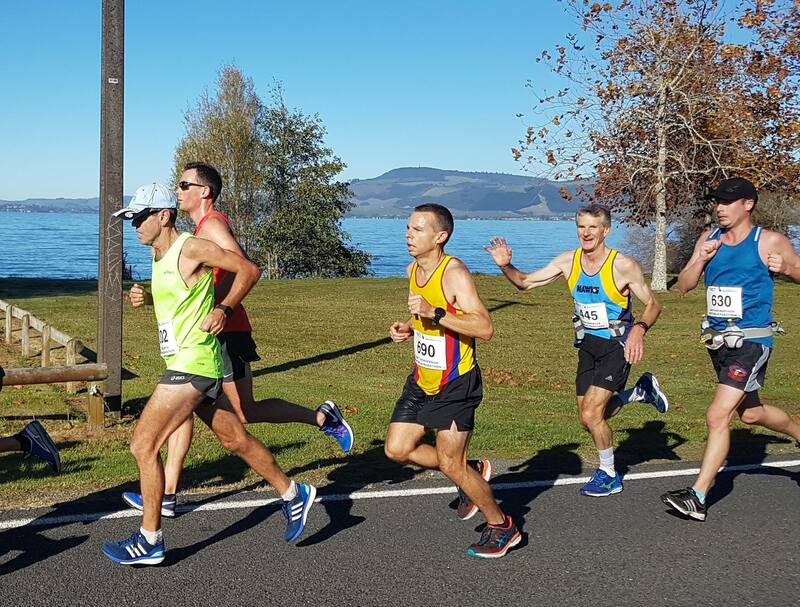 On Saturday morning 10ish of the Hawks lined up at the start of the Rotorua Marathon on a chilly morning. After a brief hi and all the best to Chris Smith, Kevin Knowles, Kovo McDonald and Marion Millward, it was time to go. Going through the first 9 kms I was in a pack moving nicely feeling relaxed then we hit the first real hill. I found myself cruising off from the pack to be all out by myself – damn it, 32/33 kms running by myself could hurt but it was great as all I worried about was how I felt and picked off a few runners who went out too hard early. It was very pleasing to have Graham riding his bike around and encouraging us along and also giving updates on how others were going. 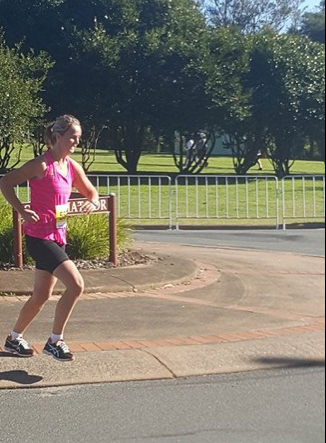 The last 5/6 km was time to start to work hard and put all the training into practice- seeing the last corner was a welcoming sight and seeing the timing clock even better – yes a new marathon PB by 20 minutes. 2.48.49 10 overall (2nd Age Group). The joy on Grahams face while I was sitting dead in a chair was fantastic.It was very pleasing to be still hanging around the finishing line seeing all our other club members come in. Chris Smith sneaking in another sub 3 2.59 (1st AG). Kevin Knowles in a very tight finish in his AG, all top 3 within 40 seconds of each other 3.06 (3rd AG). Kovo MacDonald running after having a cold all week performed really well for 4th female overall 3.09 (3rd AG). Jason Hindrup broke out a very impressive run doing a PB by more than 20 minutes followed closely home by Sam Le Heron in 3.15 who was closely followed home by Marion Millward 3.18 (1st AG). Vaughan Swale 3.53 and Evan Primmer 4.35. Fantastic running by everyone out there on Saturday – now some relax time before sinking our teeth into something else. 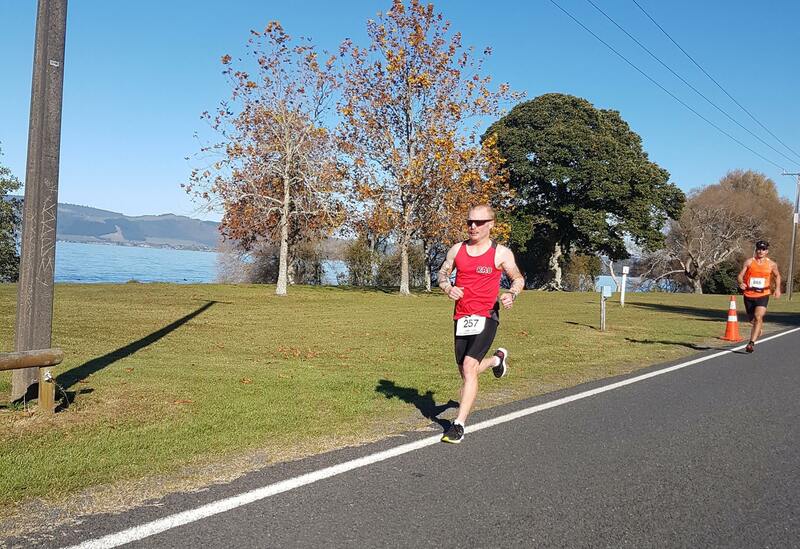 Your mission should you choose to accept it… is pacing the 5 hours 15 group at Rotorua Marathon. 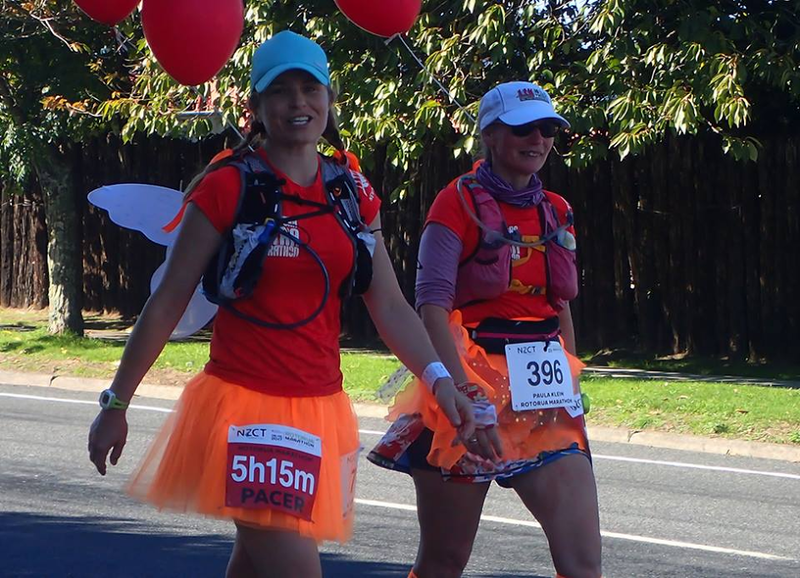 Bright orange t shirt, tutu, hair ties and leg sleeves on and a pacing band, which allowed for the wee hills. So after a coffee and two red balloons in place, we were ready to line up (all of the pacers). An unruly bunch we were (lucky we were herded into a room upstairs for a briefing and photo session). The day was brisk but we soon warmed up, our biggest mission was keeping pace and we had to slow down many times. A walk run option helped many people out around us especially up those lovely hills at the back of the lake. The k’s ticked off quickly especially when we were checking our pace band and making decisions on how fast or slow we should go. There were photos ops along the way and we had many comments about our bright orange attire in support of Ross Steele’s 100th marathon. A fun day out which earnt us a medal and T shirt for our efforts. Oh and we skipped across the finish line after a dramatic pause to ensure we were right on pace. Woke at 5am Saturday morning, still dark and the air was crisp and cool, I knew it was going to be perfect running conditions. Arrived in Rotorua just before 7, parked and registered ready for an 8am start. When the starter gun went off I knew I had to pace myself because I always seemed to get swept away with the crowd. For the first 5 kms I cruised along, warmed into the run, because it was freezing and took in the scenery. Such a beautiful place to run. I knew that I was feeling pretty good and at 10ks I started to pick up the pace. Turning back onto Te Nga road heading back into town and I was feeling strong. At 16kms I started passing people. Turning in towards the finish line with the end in sight it was such an amazing atmosphere. Finished in a time of 2 hrs 26 secs. Such a great run and watching the marathon winners come across the line was a fantastic way to finish the day. Thank you so much Helen, for helping me achieve this goal and to Dan for driving me and supporting me. Congratulations to everyone who ran and especially those who achieved PBs. It really was a spectacular day.